Well I've been quiet lately but not totally quiet behind the scenes. If you read my posts you'll know I've been ill and the recovery has been slow with a lot of fatigue so I'm finding it difficult to get things done. I had an idea for upcycling tin cans and the chalk paint is just perfect for this - it goes on easily and only needs a couple of quick coats. I've now added some of these to my Upcycled Section of shop. 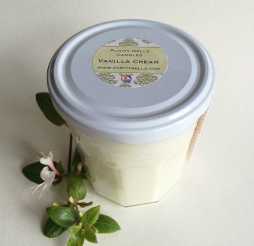 Here are some of the candles you can buy there, all made from upcycled containers and pure soy wax. As for the tins, here they are individually - I'm so delighted with how they have turned out! I just think they look really pretty and are great value because they will burn for absolutely ages. Once I caught the chalk paint bug it was hard to stop - next thing to revamp were some photo frames and bathroom accessories. I repainted the main bathroom upstairs a while ago and thought that duck egg blue would be a lovely colour to go with the walls. I had random frames, all in different colours so to pull it all together I used Ruskins Duck Egg Blue Paint. Finally here are two framed pictures of watercolours my youngest daughter Izzy did - I used clotted cream again to pull the two frames together - one was found in a charity shop and the other bought in Tiger but I think they'll look really well on the wall together now that they have been repainted. Well, that's it for now but I've lots of paint left so who knows! If you have any chalk paint projects you'd like to share, I'd love to see them. I love the chalky look of that paint. I much prefer it to normal emulsion or gloss. You've really made a difference with it too. It's so easy to use and loads of lovely colours available. I have such envy right now! I'm a sucker for chalkboard paint. It makes such a great simple DIY project to up-do old furniture, or create little gifts like you have. The price has always put me off purchasing though - still a stingy student at heart! It is a bit pricey but I just bought the little tins which were less than €7.00 and they do go a long way if the projects are small like mine. Cliona, I LOVE these candles!! 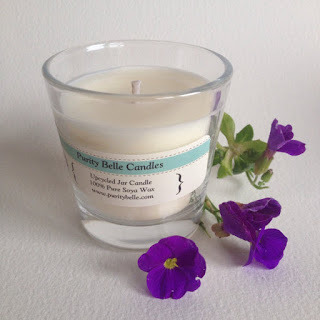 Am so happy to have come across this site - will be making my next candle purchase from you for sure :) All so pretty. Love that you use soy wax and upcycled materials. Oh I love these, I am mildly obsessed with chalk paint, I just painted a tin can in duck egg blue from annie sloan to hold my makeup brushes, so handy! !